The proposed 21-unit development was located in environmentally protected dunes on the shore of Lake Michigan, prohibiting project approval. 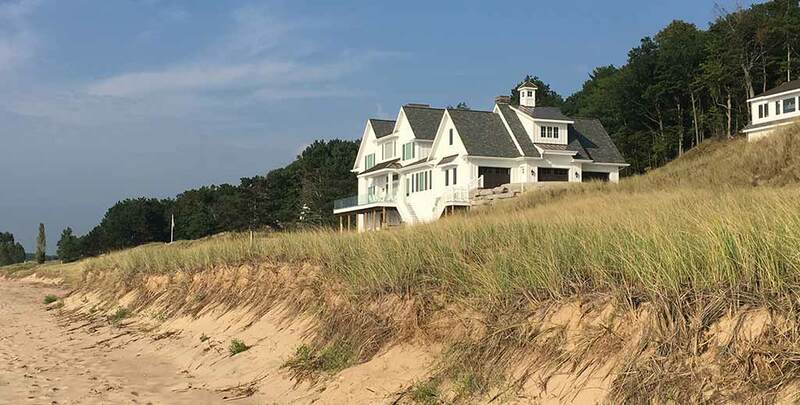 The critical dunes would have been damaged if the developer used full-width streets, as required for an unprotected development, and the State DEQ was poised to deny approval. In addition, the development is located several miles from the closest fire station and has very limited water availability for suppression efforts. The AHJ worked with the developer to make environmentally safe accommodations. In exchange for installed fire sprinklers in all houses and attached garages, narrower streets were permitted. This avoided impact on the dune areas and ensured fire protection for all the homes. The development was allowed to proceed with construction. The first 21 water front units were marketed at $3-$5 million each. The developer is considering building additional, more affordable units in the area, which will also be sprinklered if built. The average cost for home fire sprinkler installation in West Michigan is $3.00-$3.50 per sprinklered square foot. The same AHJ worked with the developer of a 31-unit development in neighboring Douglas, Michigan. In exchange for installing fire sprinklers in each home, the AHJ allowed the developer to build with a single access point. These units are marketed at $400,000 on average.